Mindhorn is the cinematic equivalent of that friend who takes forever to decide what they want to eat: chances are you'll have a good time regardless of the decision, but that doesn't make the journey there any less frustrating. Written by lead actor Julian Barratt and supporting cast member Simon Farnaby, the film's script is scattershot to say the least. But it's also charming, light hearted and frequently very funny. Mindhorn establishes its tone immediately in its 1980s-set TV shoot, as actor Richard Thorncroft (Barratt) tries to woo his actress girlfriend (Essie Davis) on the set of his cop show Mindhorn - he plays the titular character. We then jump into the present and find Thorncroft as a failed actor, until he's contacted by the police with a strange request. A deluded criminal on the Isle of Mann - where the series was shot and set - believes Mindhorn to be a real detective, and will only divulge information to him. Happy for the publicity, Thorncroft enthusiastically dons the costume and heads to the island, but the case proves more complex than he initially thought. Right off the bat, the best thing about Mindhorn is its performances. Every actor here brings their A-game: Barratt is unashamedly wacky in the lead role; Farnaby turns a one-note character into a reliable joke cannon; Davis brings her character through a notable comedic journey across the film. Russell Tovey is also on hand in a scene stealing turn as the accused criminal, both his line delivery and physical comedy are perfectly executed but he still infuses his character with an appropriate vulnerability. It's a simply brilliant comedic performance. Never taking itself too seriously, Mindhorn soars through its brief running time. This is a film of fundamental silliness, one that couldn't work if it tried to grow up a bit. Its stupidity is infectious though, especially demonstrated through a handful of terrific visual gags. In one, Thorncroft escapes the murderer by darting backwards through a bush, and in another a graffitied car window is rolled up in a rather awkward place. Like the best visual gags, they're impossible to explain without context but impossible not to love in the moment. 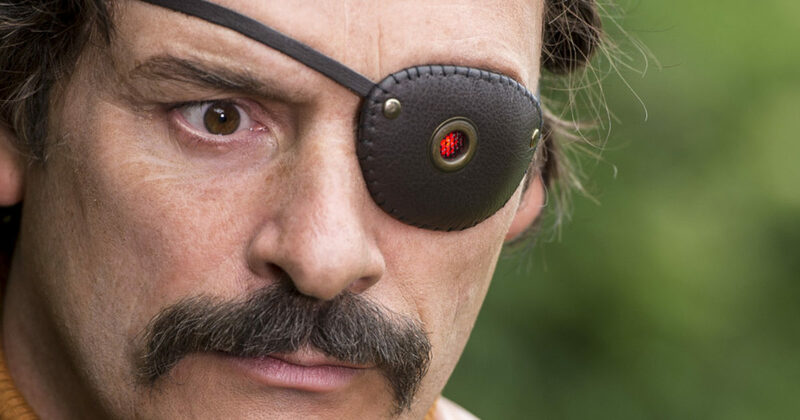 While the visual jokes are consistently effective, Mindhorn tends to struggle in forming its own comedic identity, or any identity at all in fact. The film is wacky, but not quite wacky enough for this to be its niche. It ends up stuck in the uncomfortable midpoint between conventional comedy and delirious farce. It stumbles between the two and handles them both solidly but it would perhaps fare a bit better if it pushed the wackiness that little bit further. Mindhorn as a film consistently feels unsure of itself. The script reportedly took a decade to piece together but it still lacks confidence, never quite plucking up the courage to go all out - every time the film sets its sights on something insane, it always pulls back again. It demonstrates good self control, but Mindhorn should be a film that doesn't need it. Go all out, be mad and weird and wacky - who knows, you could stumble on something great. It may not possess the unique voice it thinks it does, but Mindhorn remains a giddy and frequently funny comedy boosted by first rate performances and an admirable refusal to take itself seriously.